When we use the term “game design”, it can mean a lot of things: from a zerg rush in Starcraft, to collecting stars in Mario Galaxy and even the hook of Farmville. With the rise of social and mobile games, the push to grab the “non-gamer” market has never been stronger. From that, more titles are trying to attract people using specific design, such as incredibility simplified mechanics, monetization and the use of face book features. While the use of these tactics have been denounced by mainstream designers and the indie market, that doesn’t exclude them from trying to hook people to their games. MMOs with huge leveling curves and grinds, titles that require the player to keep playing and even Civilization that coined the phrase “one more turn.” Let’s not forget the F2P market which has been designed to get people to constantly spend money. All this brings up an issue that we haven’t discussed much in the industry: Ethics in Game Design. Or to be more specific: are there mechanics in design that could be considered unethical? Mainstream and AAA developers have been hurt the most in the last few years. The mobile, indie and social market have grown considerably and are providing content to gamers at a fraction of the cost of a company like EA or Nintendo. To combat this, we’ve seen an increase in micro transactions designed to reduce the time playing a game. Both EA and Capcom with their games have purchasable cheats available that reduce the difficulty of the game. The reason is that they don’t want people to be stuck at in one game for a long time; they want them to finish the game quickly then buy more content or another game. This mentality is reminiscent of the arcade era: where arcades were designed around a quick turnover between players. Some of the most highly regarded games use tactics to get people to continue playing. PopCap games are designed in such a manner. Their games are made to quickly get into and understand, then provide constant hooks to keep them playing. In this regard, Zynga and PopCap are two sides of the same coin. Both try to hook people as quickly as possible and use their design to keep them playing. Where PopCap tries to keep people playing to see the entire game, Zynga wants them to keep spending money. Many Indie developers cry foul over tactics like the ones mentioned, however they aren’t distinguishing between monetization like Zynga and EA, and design like Civilization and PopCap. There is a prevailing attitude among certain Indie designers that they are better than designers that use mechanics to get people to play (and continue playing) their games. However, that viewpoint may be just as short-sided as mainstream designers trying to speed up people’s playing experiences. While I was at GDC this year, I attended both the independent award show and the choice award. At the beginning of the Indie award, the host gave a speech that left a bad taste in my mouth. What it basically amounted to was: “Indies are the only ones who can make unique games because they are the only ones smart enough and brave enough to do it and that’s why they are the best.” And it felt that a lot of people agreed with this statement. I have a lot of respect for Indie designers who are creative enough to make unique games. However with that said the attitude that you’re better then someone because you don’t care about money is very disingenuous. This feeling gets back to the “games as art” argument that some Indies talk about: that a game should not be aimed to make money but to make a statement. No matter how many times designers say it and if they shout it out from the rooftops, the Games industry at the end of the day is a business. If you’re not making money with your games then you are not going to last. Saying that you are creating a game for art’s sake and not about the money is a misnomer. Unless you have a lucrative part time job, or a rich relative about to kick the bucket, the profit of your game is a huge deal. Making what could be considered an “art game” or something not intended for the mass market is fine. However, don’t rub it in people’s faces that you don’t care about the money, as there are plenty of designers who could use that. Now, this is not me raising the war banner against the Indie community. As I’ve read more stories of Indie designers whose success of their game would mean the difference of having a roof over their heads, or being thrown out on the streets. These stories usually end with a happy ending of the designers surviving and making more than enough money to continue doing what they want. They’re not being smug about it, but grateful to their fans for helping them survive. This takes us back to the original question: “are there mechanics that could be considered unethical?” Thinking about it, this question is similar to a blog post I made several years ago. I talked about the idea of gender specific mechanics: or if some mechanics were predisposed to appeal to men or women. My thoughts concluded that mechanics by themselves were not, but how they were used in the design of the game were. That same opinion is where my thoughts are on ethical design. At the end of the day, what function do these mechanics serve? If it’s to keep people playing or seeing content, then I’m perfectly fine with it. However, if the mechanics only serve the purpose to force people to spend money then I think that’s unethical. When I played World of Tanks, the further I went, the more pressure there was to spend money. Once you get to the higher tiers, it’s very easy to lose most of your in game credits on tank repairs due to how little you make unless you play perfectly. However, if you spend money per month on a premium account, then you won’t have that problem thanks to bonus credits earned per match. Premium tanks (that can only be purchased with real cash) come with a credit bonus for using them further giving the incentive to spend money. Looking at other games in the Free-To-Play market is where things aren’t so black and white. With League of Legends for example, while the designers obviously want you to spend money, everything that is game-play related can be earned over time. Yet in Age of Empires Online, your strategies are neutered unless you spend money on a premium civ and skirmish mode must be bought. The give and take between providing entertainment and making money is a tricky balance, and one that has gotten harder to keep. As a positive example, while I was at GDC I attended the discussion about the merits of F2P design moderated by Tom Chick. There, one of the developers behind the F2P game: Realm of the Mad God made a very convincing case that I didn’t think about. He said that with F2P and the monetization available, he was able to create and support a game where he didn’t need to assault players with advertisements and gated payment mechanics. All by keeping the game free and giving the choice for players to spend a few dollars on little things. This was really the first time that I heard a great argument for the pros of F2P design. Recently, the line has begun to blur even more in the social and mobile game market. Over the last few months social and mobile games have been moving from emulating titles like Farmville and have begun cutting out the middle man as it were. Apps and simple games built around casino play like Poker and Slots have begun to show up. Personally I find this troublesome as recently I had chance to witness the real life equivalent. I just got back from a family vacation in Las Vegas. As someone who isn’t a gambler I had plenty of time to examine the casino culture and I personally find it very unethical. From the slots to the hotels themselves, the whole industry is not built to provide a service to the consumer, but instead to take their money. Everything in the casino is designed to get you to spend money gambling. And if something can’t be used, then it is made as frustrating and out of the way as possible to convince you to not do it. The hotel rooms had very little in the way of amenities, as they want you out on the floor at all times. Unless of course you booked a suite, where you must have had to spend a lot of money or got enough comps gambling to afford. The thought of this mentality seeping its way further into game design is one that scares me. I’m ok with games like Mario or the “One More Turn” persuasion of strategy games. But, when a game is designed from the ground up to do nothing but continually take money from me, I have a problem with that. With so many sources to play games, this discussion will not be going away anytime soon. As social games try to keep people playing, mainstream designers will keep a close eye to see what worked and what didn’t. And as the age of digital distribution and DLC grows, we’ll need to figure out exactly where the line is between taking money and providing content. This is it ladies and gentlemen; the start of ARPG season 2012 begins with one of the most anticipated games this year. Diablo 2 has arguably been the king of the genre and the model that others have been judged for some time. With Diablo 3, Blizzard has gone over the formula again in an attempt to hook new and old fans yet again, but the amount of accessibility may be its undoing. We’re going to skip the story part of this analysis as we have a lot to discuss. With Diablo 3, Blizzard has made several revisions to the design. First let’s talk about the good. The class design is easily some of the best from the genre both in variety and skills. Each choice plays completely differently from each other and removing the ubiquitous “mana pool” and replacing it with a unique energy source per class was a smart move. The other change to class design and one that I really liked was the revision of the rune system. Originally, Blizzard wanted the player to find runes in the world that could be equipped on the different skills of each class. Using the same rarity system for loot drops, players would upgrade their runes over the course of playing and make their skills incrementally better. During beta, the designers realized that this form would amount to too much work without much gain and instead changed it. Now runes are unique both per class and per skill and unlock with leveling. I wasn’t a big fan of this when I first heard it, but having played it, the new system works. With the runes now unique, it allowed the designers to make them to be more than just mere stat boosts. Each rune radically changes the dynamic of said skill and when you combine this with the limited skill selection, it leads to some great in game choices. Here’s an example of a choice I had with my witch doctor. His first skill is a blowgun that shoots poison tipped darts. The first rune you equipped can turn it into a three dart rapid fire attack doing more damage. The next rune will replace the damage with a movement debuff keeping enemies from getting close. Now you could choose one or other, but then there is his other skill: grasping hands, that summons a section of hands to grab the enemy. It normally comes with a movement debuff, but you could put a rune on it to increase its damage per second. The choice then becomes: what can I do with these two skills to make them work together? With the limit of six skills and three passives, there are a lot of choices for how do you want to define your character. Chances are as time goes on, we’ll hear about legendary builds that players have used to turn the game into a cakewalk. While the Diablo story may not be winning a Pulitzer anytime soon, the writers and artists at Blizzard have done a lot to flesh out the world. The game looks great and there is a visceral feel to the combat. As each character’s abilities tear apart enemies differently, makes each area look like a battlefield when the fight is over. New follower’s each with their own personality and skills, give single-players an able partner. Instead of having the lore in the game manual, lore books are scattered around the world fleshing out the story of the game and of the different enemies. With most dungeons and outdoor sections randomized and mini event that can happen while exploring, give players something to look for on repeat plays. The boss battles of Diablo 3 are some of my favorite from the genre. They’re not about whaling on an enemy for 5 minutes and hoping you have enough potions to last. Each boss has unique attacks and tells requiring the player to be as much on defense as they are on offense. So far everything mentioned has been a positive but with so many things Diablo 3 does right, it’s the little things that add up to big problems. First are the classes themselves, the problem is that there is no permanence to each character and the idea of personalization is an illusion. Each skill once unlock will act in the same manner for all time or until Blizzard releases a patch. While the runes do provide noticeable changes to their respective skills, once modified, the same problem remains. While I’m fine with being able to mix and match at anytime, without some kind of growth, it eventually renders the act of leveling meaningless. On my witch doctor, once I had my six skills and runes set, suddenly there was no reason to care about leveling anymore. This happened around level 26 and I still had 34 more levels to go up before I hit the level 60 cap. If there was something that I could do that would not be easily replicated or there were more choices, then I could say that my character was personalized. The passive skill system was designed with that in mind, but with only being able to choose from 3 of 15 available, once again leaves the player limited once they reach the cap. When I go more than 10 levels without making any major changes to my character, there is a problem. To keep every skill viable, the designers made every damage causing skill scale based on different percentages of the character’s DPS (damage per second.) This by itself was a great change but when we look at this along with the simplistic attribute system, a problem rears its head. In Diablo 3, while characters still have 4 main attributes, players no longer assign points to them. Instead characters will gain a few attribute points on level up and the rest from equipment bonuses. The problem is that the designers went too far with simplifying attribute bonuses and hurt the options players have. In Diablo 2, every attribute had value to each class. Intelligence affected mana pool, strength affected melee damage and so on. But in Diablo 3, only two attributes matter per class: vitality and a primary stat. The primary stat affects both the defensive options of the character and adds a direct bonus to DPS. What that does, is now the only equipment that matters is if it has a bonus to the primary attribute or vitality. As a barbarian, there is no reason why I should take gear that gives a bonus to intelligence when I have one that gives a bonus to strength. Since all skills scale from DPS only, it’s suicide to not boost the primary or vitality whenever possible, especially on the harder difficulty levels. The other consequence is that the search for loot has been dumb down. Each class can only realistically search for items relating to their primary stat. All barbarians are going to want strength items, demon hunters: dexterity and so on. If the other attributes offered some kind of meaningful bonus, like increase power regeneration or add a small bonus to the effect of each skill that would be a different story. However, with the simplistic attribute system, the search for loot has been neutered. Given the decision to base each class on one main stat, I’m confused why I kept finding class restricted gear that gave bonuses to other attributes. The culmination of the simplistic changes comes in the difficulty system. Blizzard has said in the past that they wanted normal to be easy or casual mode. Which is a fine opinion, but to make it that way the designers stretched the content to its breaking point. In Diablo 2, players could find a wide variety of item rarities and modifiers from the get-go, and that feeling that you could find something great at anytime was an excellent motivator. With Diablo 3, both modifiers and higher item rarities can only be found on the higher difficulty levels. As an example, when playing Diablo 2 within the first act I got lucky and found one set item and one unique. However in Diablo 3, I didn’t find either type over the entire course of normal and nightmare mode. The # of modifiers is also limited, with no resistance type modifiers in normal mode. The problems with loot could also be seen in Torchlight 1, where the player was bombarded with so much loot that the player couldn’t use or didn’t want that it made the search for loot more of a chore. The difference is that Torchlight did it due to not properly curving up equipment attributes. While Diablo 3 is due to limiting what attributes work for each class and gating the access of more varied gear behind the difficulty settings. I can understand wanting to ease people into the game, but with normal mode so easy to begin with, moving a lot of the deeper decisions and rewards to higher difficulty levels feels like it is punishing expert players. It’s very hard to get stuck playing normal mode, and the only times things were challenging for me was when I was playing with 3 other people and the bonus to monsters was in effect. Normally the analogy is: having to eat your vegetables before having dessert. But in this case, it’s like being given a cake that’s 10 days old, and told that once you eat that, then you can have one that’s 5 days old, then 2 and finally a fresh cake. Finally let’s talk about Blizzard’s decision to require a constant internet access. For those that didn’t follow it, for Diablo 3, Blizzard has implemented a real money auction house system. Instead of trying to fight the people who sold items for cash in Diablo 2, Blizzard has now embraced it. The consequence is that to prevent people from using hacks and creating duplicate items, they want everyone to be on the battle.net service while playing. This decision has fractured the community to some extent. The biggest issue for gamers is that if the server they’re on starts to lag, this can affect the game. I’ve had cases where I died from lag spikes or my health going from full to near empty before the enemy attacked. For me, while I can see the benefit of being connected to battle.net, I have to argue against it. As the benefits don’t have any bearing on what makes Diablo enjoyable. Overall Diablo 3 is a good game, the changes to class dynamics and skill selection as a whole help elevate the design. However, it feels like Blizzard tried to fix something that wasn’t broken with trying to make the game accessible. In the process, Diablo 3 feels tame and that there is a whole lot of tedium beating the lower difficulty levels before you can see what’s considered the meat of the experience. Personally I hate leveling games that say that the game doesn’t begin until you reach the cap, which is also why I got as far away from World of Warcraft as possible. To be fair to Diablo 3, Diablo 2 didn’t reach its legendary status until after several patches and the additional new content with the expansion pack. As it stands, Diablo 3 is much better all around compared to Diablo 2 at launch and the issues present aren’t enough to ruin the experience. If you’re expecting a grand revision of the ARPG formula, you may be disappointed with Diablo 3. But Blizzard has hone their craft over the years, and the subtle changes do a lot to elevate Diablo 3. And if they can fix the problems mentioned here, I’ll have no issue with giving the ARPG crown to Diablo 3. Xenoblade Chronicles, the latest game from Monolith Soft has gotten a lot of press from last year. After its release in Japan and Europe, the game received high marks all around. When news got out that Nintendo wasn’t planning on releasing it in the US, fan sites, game columns and petitions sprang up to get Nintendo to change their mind. Finally the game was released in the US in a limited run from both GameStop and Nintendo. Which leaves us with one question: Did it live up to the hype? To make this analysis short… yes, yes it did. XenoBlade is not only a step in a new direction from standard JRPG design, but also from the usual story and character design. In many ways it feels like the designers took a long look at both JRPG and MMO design, saw what worked and what didn’t and threw the rule book out. Let’s start with the story, the game takes place on top of two titans. A long time ago, these two titans were fighting a never ending battle for dominance, when they each landed a killing blow on the other at the same time. Many years after, life appeared on each titan, humanoid people on Bionis and robots called mechon on Mechonis. A war is going on between the two groups as the mechon invade and appear to consume the people of Bionis. The mechon are immune to all conventional weapons except for a magical sword called the Monado. The main character in the game is Shulk, a boy who is researching the Monado after the last great battle between the two groups. When the mechon invade killing his best friend, he discovers that he’s the one who can wield the sword effectively. While the game begins as a tale of revenge, the story grows as Shulk realizes that there is more to be done then just getting revenge for his friend’s death. And the story continues from there with twists that I’m not going to spoil here. 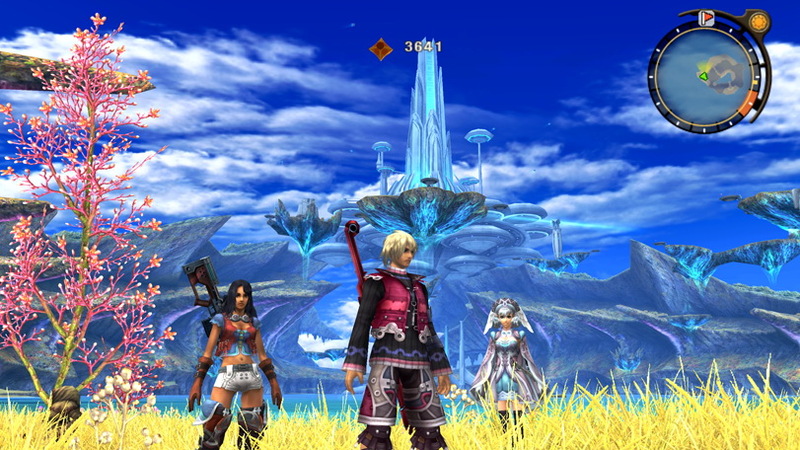 The gameplay of Xenoblade in many ways feels like the next step up from Final Fantasy 12’s design. Combat is entirely real time, as the player controls one member of their team while two other members provide backup. As in a MMO, enemies wander around the world either alone or in packs. Every party member has a basic auto attack and special moves called “arts”, which are unique to each character. For example Shulk has a lot of positional arts that do more damage or cause special effects if he is facing different parts of the enemy. You can only equip so many arts per character, forcing you to decide how to set everyone up. To the game’s credit, the party AI is smart about using arts. You won’t have to worry about someone healing at the wrong time, or using a positional skill at the wrong area. Advance maneuvers involve a three step way of knocking down enemies. First you have to inflict “break” status, then topple which stuns and finally daze that cancels any attacks the enemy has planned. Once again the AI knows to follow up each stat affect, with the correct one in the chain. The big difference between Xenoblade and other RPGs is how so much of what could be considered “fluff” of the genre has been taken out. Your party automatically heals after every battle, even those that were knocked out; this also eliminates the need for recovery items. You can quick travel to any location once you’ve been there once along with landmarks within each area. Most quests auto-complete once you have met the conditions. While the game does feature a day/night cycle, players have control of the clock allowing them to easily switch between the two periods for exploring. You can see at any time where you need to go for the main quest. One decision that is a god send is that any items from enemies that are required for quests can drop at anytime while fighting them. This means that you can effectively finish quests before you even found the quest giver. What makes this even better is how much content the designers put in to replace the filler portions of JRPG design. Each area of the game has a relationship rating, which grows based on talking to named NPCS and completing quests there. Each time the rating goes up, new quests and items that can be acquired through trading are unlocked. This not only gives players a reason to explore cities, but also keeps areas from being just a onetime visit. Several areas also feature enemies way beyond the level range of the rest, allowing players to come back to fight them for new materials and gear. Each character starts out with three skill trees unique to them. Completing battles earns skill points that will unlock the nodes on each tree. These skills provide a variety of buffs to the team mate, but that’s not all for this mechanic. As party members fight together, their relationship with each other will grow, and teammates can share skills with other members. Each skill has a cost of affinity coins, forcing you to decide what skills should be shared, as you won’t be able to give someone every skill available. One other mechanic that players can delve into is gem crafting. After a story point, players can take crystals found off of resource points and enemy drops and refines them into gems. The gems themselves offer all kinds of bonuses, from resisting status affects to increasing damage. Said gems can be equipped to gear that has slots open. While this mechanic is more of a bonus for the main content, people looking at post game areas will find these gems to be invaluable. Xenoblade Chronicles does a lot right, but it’s not perfect and there are several annoyances that need to be mentioned. While the designers did much to cut down on filler content and clutter, there are a few areas that were missed that feel like oversights. First is the UI itself. The player will have to go through multiple menus to accomplish basic tasks. To fully examine your team, there are three different menus the player must go into one at a time. First is the character menu for party formations and gear, then the skill menu for selecting skill trees and finally the arts screen for assigning and powering up arts. While the main quest is easy to follow, the designers did not work the same magic with side quests. As mentioned, most quests auto complete once the player has fulfilled the conditions. However, quests involving named NPCs require the player to return and this is where the trouble starts. NPCs appear at specific areas of cities during a certain time of the day. In order to find where the NPC is, first the player has to visit the quest menu and locate the correct quest that has the location closest to the NPC. Then the player has to visit the affinity chart which shows all the NPCs of each area, find the person on it to know when they are around. Finally they have to go there and try to find the person. Not helping matters are that there is no way to distinguish quest givers on the affinity chart, requiring the player to go through the entire section to find the person, and if they forget the sometimes weird name, then it’s back to step one. What makes this so much of an oversight is how important this is for getting the best gear and unlocking new skill trees. The player will never know what random quest chain could lead to the player unlocking new skills for a specific party member or a new weapon. Another problem is the lack of a beastery or enemy record. There are a lot of items to be collected in the game, some from the areas themselves and some off of enemies. Many quests require items from specific enemies, however not every quest tells you what those enemies are or where they are located. Compounding matters is that many enemies only appear at specific areas and times of the day. This makes Xenoblade a game that you cannot come back to in a few months and settle back into things. As I don’t think it’s possible to remember the locations and drops of every enemy in the game after that time has passed. The last set of problems are more of a nitpick regarding the design itself. Xenoblade’s combat leans more towards the MMO side of things compared to JRPG design and this could rub fans of the genre the wrong way. One example in particular is regarding level differences between the player and enemies. Like a MMO, the game color codes the enemy’s status based on their threat level to the player. For example, blue means easy and red means not a chance. The larger the difference between the level, the larger the accuracy penalty is to the weaker group. Realistically speaking, a player can fight an enemy up to five levels above their party. Anymore than that and the accuracy penalty against them can be too much to overcome. There are plenty of cases where the difference of one level can turn a fight from being impossible, to a cake walk. For fans that prefer tactics and skill to win the day, they may not like how much leveling is relied on. Finally one area that I felt was underdeveloped was the concept of blocking enemy arts. As you play through the game, you’ll eventually unlock the ability to receive warnings about enemy special attacks. However, the only defensive art that blocks attacks only blocks one kind of art and I had cases where it wasn’t reliable. With all the characters available, I was hoping to see the defensive system expanded on, but it never grows beyond just the one special art. These problems over the 100 + hours I spent playing Xenoblade Chronicles eventually are lost in the ether. Not only is Xenoblade Chronicles an amazing game for the Wii, but it’s also an amazing RPG. The highest praise I can give it is that it definitely earns the title of “system seller”. For RPG fans looking for a different take of the genre or just a really great game, Xenoblade Chronicles fits the bill. While the year is nowhere near finish, I can easily say that Xenoblade Chronicles has earned a spot on my “best of” list.